Nov & Dec daily 10-5, Jan-Mar 10-4. We offer three museum sites that each highlight different aspects of Door County maritime history. A two- or three-day trip is an ideal way to explore each unique site as you travel from Sturgeon Bay along the Door County peninsula. 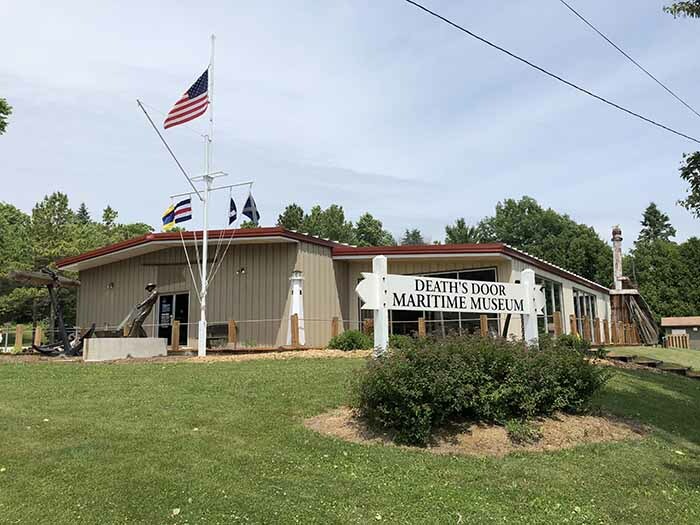 The Door County Maritime Museum in Sturgeon Bay was established in 1969 and now includes four amazing galleries that feature lighthouses, model ships and boats, shipwrecks, the area’s numerous shipbuilding companies and more. The museum includes an in-water exhibit of a completely restored 1960s era tug boat that was built in 1919 and served until early 2000. The museum is located between the two downtown bridges, the historic Maple Street steel bridge and the newer Maple-Oregon bridge. Across the bay is Door County’s largest shipbuilder, Bay Shipbuilding, which can be seen through a submarine periscope inside the museum. 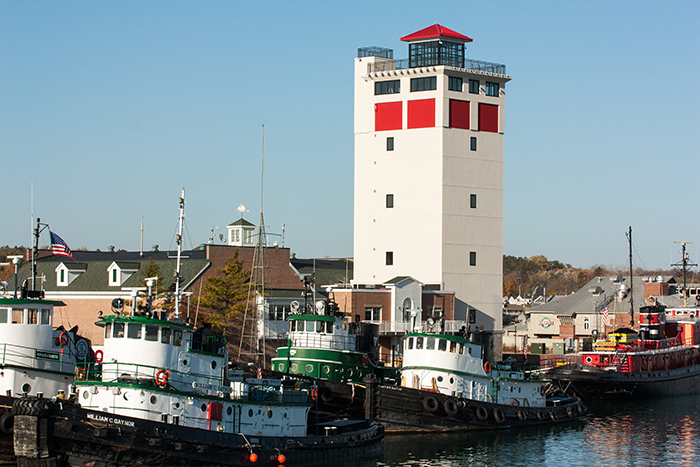 Located along Sturgeon Bay’s working waterfront, the Door County Maritime Museum showcases the area’s rich maritime roots. Hard-working fishermen, brave ship captains, skilled craftsmen, bold inventors and lonely lighthouse keepers are just some of the personalities you’ll discover in the galleries of the museum. See how these maritime pioneers worked and what they made, and you’ll understand and appreciate your visit to Door County on a deeper, more engaged level. Enjoy an all-access, 40-minute guided tour of the John Purves, an immaculately restored 1960s era Great Lakes tugboat. Explore the entire 149-foot tug, from her engine room to crew cabins, galley and wheelhouse, and get a feel for the daily life of her hard-working 13-man crew. Hours: Open year-round, 7 days a week. 10am-4pm Jan thru March, 10am-5pm April thru June, 9am-5pm July thru Labor Day, 10am-5pm day after Labor Day thru Dec.
Tugboat tour hours: Open 10am-3pm May thru October, 7 days a week. 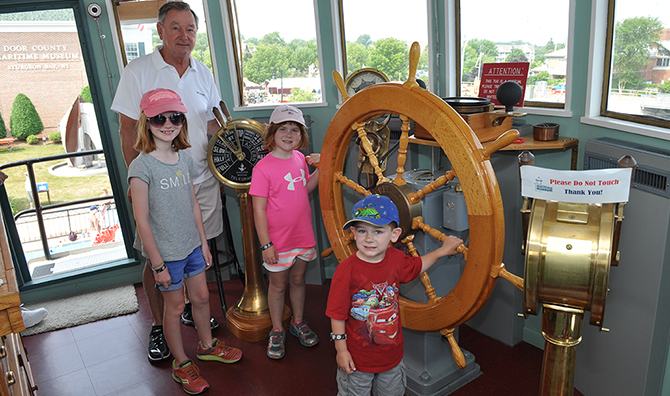 Admission Museum and Tugboat: Adults $15.00, Youth (5-17) $10, Children 4 and under free for Museum, $8 for Tug. Members and active military free. Admission Museum Only: Adults $10.00, Youth (5-17) $5, Children 4 and under free. Members and active military free. Admission Tugboat Only: All ages $8, Members and active military free. Built in 1869 and still operational today, Cana Island Lighthouse is a Door County treasure. The Lighthouse is located on an island, which visitors reach by walking across the dry lake bottom. Once on the island, you can climb the light tower, tour the lighthouse keeper’s home and explore the grounds, which include relics from the 1900s. 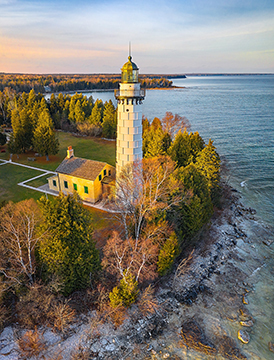 Climbing the 97 steps of the light tower to access the outside gallery deck gives you a breath-taking view of the island, the Door County peninsula and Lake Michigan. Hours: Open 10am-5pm May 1st thru last Sunday in October, 7 days a week. Admission Island, Lighthouse and Keeper’s Quarters: Adults $12, Youth (5-17) $10, Children 4 and under free. Members and active military free. The museum, which opened in 1975, is located in the small fishing town of Gills Rock at the tip of Door County. A wooden fish shanty, the fishing tug Hope and exhibits on ice fishing, shipwrecks, maritime life-saving techniques and equipment tell the story of the area. The featured exhibit is the new Death’s Door exhibit and new interactive technology. Hours: Open 10am-5pm, 7 days a week May 25-27, June 1-2, June 2 thru October 14. Admission: Adults $6, Youth (5-17) $3, Children 4 and under free. Members and active military free.